Product #45995 | SKU SLR-APO85PL | 0.0 (no ratings yet) Thanks for your rating! 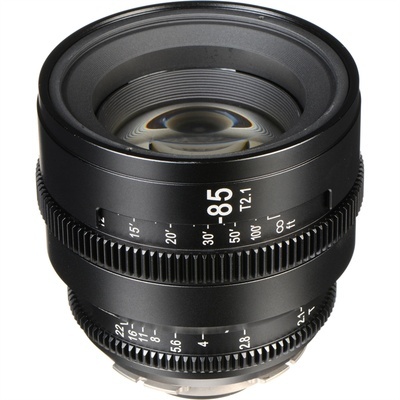 A cine-style lens that covers full-frame sensors, the SLR Magic APO HyperPrime CINE 85mm T2.1 Lens with PL Mount projects a 44mm image circle and is suitable for use with select cameras that have a 6K sensor. It features cine-style focus and iris gears and an internal focus design that allows you to pull focus without the length of the lens changing. This makes it well suited for use with rod-mounted lens accessories and matte boxes. The 300° of focus rotation provides for precise focus pulls especially when working at close focus. The lens focuses in the industry standard direction and has a 95mm front diameter. The front of the lens does not rotate as you change focus, which may allow for the use of clip on matte boxes and sunshades (depending on weight), as well as polarising filters. The lens incorporates an ARRI PL mount that provides a simple, strong, and highly reliable mount. The lens covers full-frame sensors. The internal focus design allows you to pull focus without the length of the lens changing. This is especially important when working with rod-mounted lens accessories such as follow focus units so that the gears remain engaged as focus changes. The consistent lens length also makes using a rod-mounted matte box simpler, as there is no concern for pushing into or pulling out of the matte box, and you don't need a bellows style anti-reflection ring. 300° of focus rotation enables precise focus adjustment, especially as you focus close to the lens.